LABUAN: Dengue cases are on the rise in the duty-free-island here with 13 cases reported so far this year compared with only three cases in the same period last year. 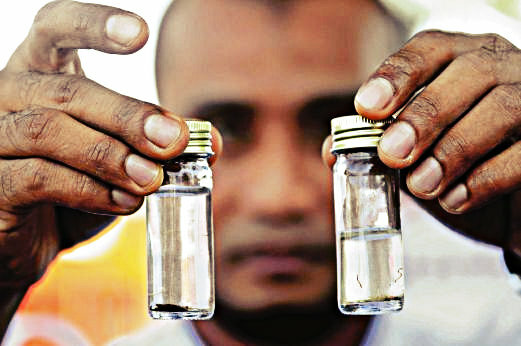 Labuan Health Department director Dr Ismuni Bohari said although no death was reported, the surge in dengue cases prompted the need to remain vigilant and continue efforts to curb the aedes mosquito from breeding. "The upward trend is rather alarming and requires attention and action from all parties," he said at the Mega aedes Integrated Communal Work MPL government quarters here today. MIRI: Maintaining the cleanliness of home compound daily is the best way to fight dengue, in that it helps eliminate potential breeding grounds for the Aedes mosquito. According to Miri deputy mayor Julaihi Mohamad, preventive measures against dengue must be a continuous routine and the people should not depend solely on the ‘once in a blue moon’ ‘gotong-royong’ (work party). “We should spend at least 10 minutes a day to clear stagnant water within our home compound and discard items that can become breeding grounds for mosquitoes. “This effort must be on-going in order for the prevention measures to be effective,” he said in his opening address at the ‘Mega Gotong-Royong to Fight Aedes’ at Kampung Pengkalan Lutong here yesterday. Julaihi was representing Assistant Minister for Tourism and Senadin assemblyman Datuk Lee Kim Shin to officiate at the programme, where Lutong community leader Penghulu Ahmad Lamat was also involved in. “The eggs of the Aedes (mosquito) can survive between seven and 10 days. Once they hatch, the mosquitoes can live up to three months and within this period, can lay thousands of more eggs. “This is why we must make sure that efforts to rid our environment of mosquito breeding grounds must be on-going. We should spend about 10 minutes daily to clean our compound and get rid of stagnant water which can become one of the breeding grounds,” he said.